We would like to extend our appreciation to the many organizations and people who have contributed generously to help make the 2011 Pen Pal Gathering possible. Project Lead: Suzie Miller, Pen Pal Committee: Patty Doxtdator-Hill, John Malcolmson, Dianne Woods, Constance Harvey, Cathy Jamieson, Wanda Davis, John Macdonald, Ashley Maracle, Karen Buehner, Francie Govan, Dianne Beaver, June Sowden, Scot Cooper, Roxanne Wilkienson. The planting of the Friendship Forest- 600 white pine saplings dedicated to the relationship building between all neighbours. 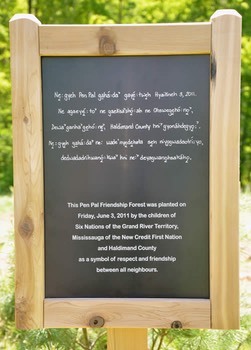 The creation of a plaque to mark the forest in two languages. 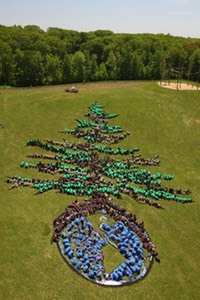 The sky art image of the Eastern White Pine (Tree of Peace) hugging the Earth. Following the event the youth created sample postage stamps for future Pen Pal Programs. The Eastern White Pine (Pinus Strobus Linnaeus), was adopted May 1, 1984 as the arboreal emblem (official tree) of Ontario. As it can grow in many types of soils, it is found all over Ontario. It has been a major source of commerce and trade since the days of the early settlers. It is a valuable resource because it provides nice softwood. It is the tallest type of evergreen tree in Eastern Canada. It continues to be a valuable resource for Ontario today. And it makes a delightful Christmas tree, too. The Haudenosaunee people are people who lived in the same area, having the same habits, own language and way of life. The people were often at war with each other, most generally over hunting boundaries. There was a lot of killing and bad feelings between the groups. A man, who became known to the Haudenosaunee as the peacemaker, came to each of the groups of people. His purpose was to stop the wars and bad feelings, by helping them return to their good mind which would unit them as one with a government, who would keep the rules created under the guidance of the peacemaker. No one person was to be better than anyone else. The people were to honor and respect one another. The people were to respect and preserve all that the Creator made. The people were to be thankful for all things in the universe. They were to give thanks to the land and all that it provides: the water, the grass, flowers, medicines, trees, fruit, sun, moon, stars, the winds and thunder, the animals, birds, fish, and the people. In order to keep this everlasting peace and harmony working for the Haudenosaunee people who were the Mohawk, Oneida, Onondaga, Cayuga, and Seneca, the Peacemaker told them that they must throw away their weapons of war, so he uprooted the tallest tree, THE WHITE PINE (THE TREE OF PEACE), and all of the nations cast into the hole all of their weapons and any object that could physically hurt another person. Then the Peacemaker re-planted the tree. The nations agreed that they would never again take part in a war and there would be no more fighting and hate among themselves. After the tree was re-planted the tree symbolized the newly formed Five Nations Confederacy (the governing body). Other nations were permitted to join. The tree has long white roots which spread north, south, east and west. Other nations could follow the roots and find peace and protection under the new symbolic “Tree of Peace”. An eagle was placed at the very top of the tree. An eagle is able to see very far and has a very loud scream. Should any danger threaten the “Tree of Peace” and the people in its protection, the eagle would scream the warning. The United Nations has declared 2011 the International Year of Forests, a time to celebrate the important role forests play in our lives – whether we live near one or not. Forests sustain us. They are a home for thousands of kinds of plants and animals, a place for recreation, and one of our best tools to respond to climate change. The Pen Pal Friendship Forest honors the importance of trees in our world and will symbolize respect and growing relationships between all neighbours. It was planted by the children of Six Nations of the Grand River Territory, Mississaugas of the New Credit First Nation and Haldimand County.